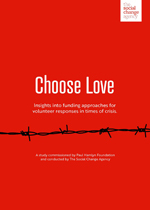 This summary provides insights into effective ways to provide timely funding to volunteer-led responses to a humanitarian crisis. Read the full report on the work of Help Refugees and their response to humanitarian crises here. The study was commissioned by Paul Hamlyn Foundation and conducted by The Social Change Agency.